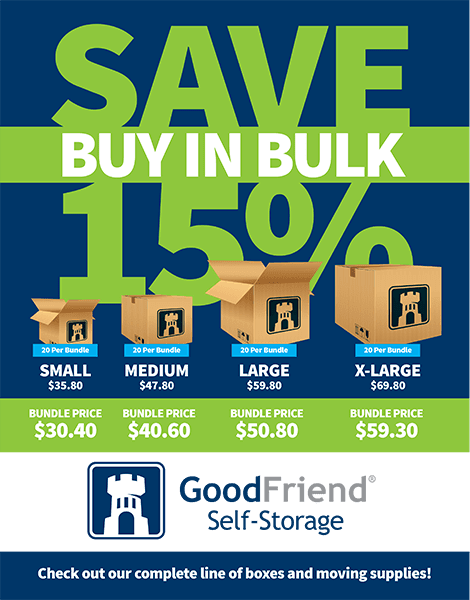 GoodFriend Self Storage offers a large assortment of quality moving and packing supplies for all your self storage needs. To purchase boxes, bubble wrap, tape, locks and more please call or visit one of our eight New York, New Jersey and Connecticut locations and a self storage specialist will be happy to assist you. Please call for more information and how to order supplies today! Label the boxes on all six sides and keep a list for easy reference. This will save you time if you have to look for something in particular. When packing boxes fill them without making them too heavy to lift. Always put the heavier boxes on the bottom and the lighter ones on top of the heavier ones. This will prevent boxes from being crushed. Be sure to store frequently used items at the front of the unit to avoid having to search for them. If it is possible store couches on an end. Stack chairs seat to seat. Use the inside of appliances and drawers to store smaller items. Store mattresses and box springs on long edges. Wrap for protection. Clothing and draperies should be stored in wardrobe boxes and on hangers to retain their original shapes. Purchase the Protection Plan. If your belongings are worth storing, they are worth insuring. Do not store any food items. This will prevent any unwanted guests and storing food is not permitted. Do not pack your boxes so that they are too heavy to carry, especially when you are packing books. Do not assume that your homeowners or renters insurance will cover your belongings while in storage. Purchase the protection plan. Do not give out your gate code to anyone that is not listed as having access. Do not use printed newspaper for wrapping, the ink may smudge and get on your items. Do not store any toxins or flammables such as paint, oil, or gasoline. These items are not permitted to be stored. If you have any questions about moving or packing tips please call us at 844-374-3631 and we will be happy to assist you.